*Please confirm what commercial parts you need to purchase before installing sensors. *Defi sensors’ thread size is all 1/8PT. *The diameter of the end of temperature sensor is 7mm. *When using a turbo sensor for ADVANCE gauges and Racer Gauges, you need turbo sensor wire. 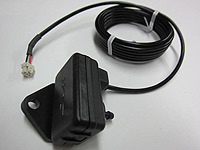 Turbo sensor wire is included in the package of product. *Turbo sensor wire is not necessary when using a turbo sensor for Defi-Link gauges. *Sensor for ADVANCE and Racer Gauges and sensor for Defi-Link gauges are NOT common. *Turbo sensor extention wire can be used for ADVANCE and Racer Gauges. Cannot be used for Defi-Link gauges. *Boost Gauge (Max 30PSI) Package includes rubber hoses and a three-way joint (Φ4).But Boost Gauge Package(Max 45PSI) does NOT include rubber hoses and a three-way joint (Φ4). Commercial items are required. ・It is required to use the hose which can withstand more than 58 PSI. *When using pressure sensor, pressure sensor wire is necessary. Pressure sensor wire is included in the package of the product. *Sensor attachment commercially available is necessary to install sensor. *The sensor for ADVANCE, Racer Gauge, and Defi-Link series are all common. *The sensor wire is different between Defi-Link series and others. *Pressure sensor extention wire are common all series. *When using temperature sensor, temperaure sensor wire is necessary. Temperature sensor wire is included in the package of the product. *Temperature sensor extention wire are common all series. *When using exhaust temperature sensor, exhaust temperaure sensor wire is necessary. Exhaust temperature sensor wire is included in the package of the product. There is no need to purchase additional parts. For example, temperature sensor and oil temperature sensor wire are included in the oil pressure gauge package. Sensor and sensor wire are not included in display products such as ADVANCE ZD and Defi-Link Display. *Sensor set for Defi-Link System and for ADVANCE System are different. The production of Sensor sets for Defi-Link System was ended in March, 2012. *Sensors are common in all series products except turbo sensor, but the sensor wires are not common. Ex. If you replace Defi-Link Display by ADVANCE ZD, you don’t have to change the sensors because sensors are common. Instead, sensor wires and ADVANCE unit needs to be purchased. *When purchasing, confirm respondency of each part. *If the length of sensor wire is not enough, purchase sensor extention wire additionally. Sensor extention wires are common in all series. *Sensors, sensor wires, and sensor extention wires are sold separately too.